Man. A lot of the stuff I loved about the early ’80s is actually ’70s leftovers, which my parents had a lot of. And this photo once again says it all. Knit tapestry draped over back of couch, check. Brass (lamp post) and gold (curtains) hues, check. The only, yes the only thing missing are those faux wood panels. I can’t believe it. 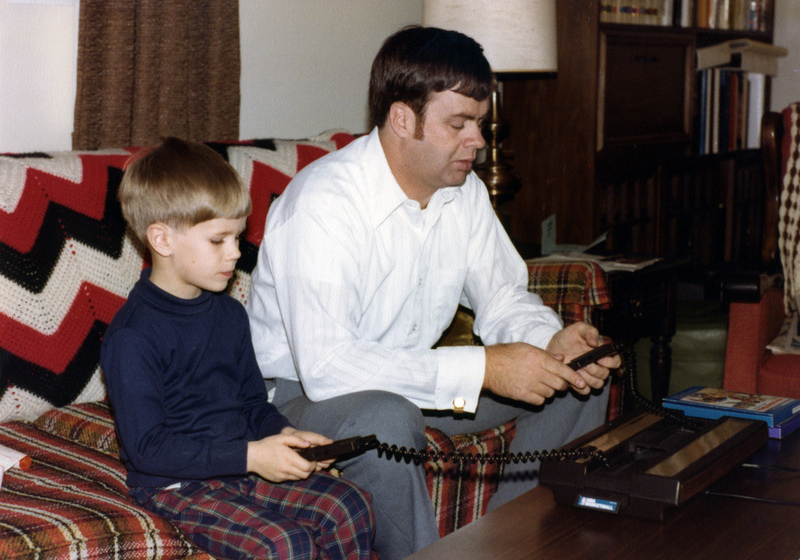 The one remarkable difference about this picture though, in comparison to all the “kids playing Atari” photos, is that neither of them (at least at the time the photo was shot) were looking at the screen, but rather at their controllers. And that’s what made Intellivision what it was. That’s definitely something us Gen-Xers could understand and identify with in this picture.